Dusters California x Girl Is NOT A 4 Letter Word " Street Angel"
Were proud to release the newest “Girl is Not A 4 Letter Word” collab! As part of the 2018 Dusters product line, GN4LW has teamed up with artist Jim Rugg and his graphic comic book heroine, Street Angel. Hints and detail of the character are depicted on top and bottom of a locker sized cruiser. 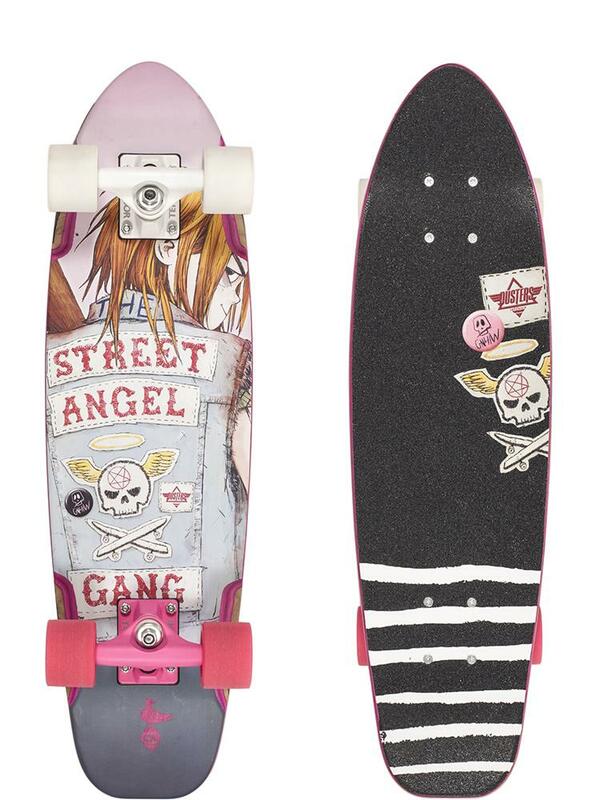 Street Angel (Aka Jesse Sanchez) is a homeless pre-teen girl, that has ninja skills, loves skateboarding and fights crime. If you haven't checked out the Street Angel series of graphic books/comics head to your local shop or purchase online! This GN4LW board gives back to our micro-grant program that financially helps girls create female based skate media, travel, set up all girls skate events and more! You can apply online (see right-hand side of our website for photo & hyperlink) if you have a cause or project you'd like us to take a look at! Dusters GN4LW Street Angel 25"
Width: 7" / Length: 25" / Wheelbase: 12.25"
New Fall 18 Lookbook is live! Check out the new longboards and cruisers! We have some rad new boards and some cool new color ways. We are proud to introduce our newest collaboration with one of skateboardings biggest icons of all time! Mr. Steve Olson! Olson has a raw, uncut, in your face attitude that can be felt through his skating as well as his art. He was the original tester of the Independent Stage 1 truck and his iconic Santa Cruz checkerboard model which became the first use of full-board graphics on seven-ply laminated maple. Fast forward almost 40 years of skateboarding history and Olson’s legacy is still alive and strong, recently being inducted in the Skateboarding Hall of Fame and becoming well known for his controversial art and other collaborations in the fashion world. Checkout our latest video from our Big Bear road trip! We grabbed our boards and jumped in the van for some skate missions and some fun on the mountain snowboarding too. Dusters celebrate another typical Californian Summer by taking the crew to skate the streets and ride some fun little waves in Baja California, Mexico. Amongst all the fun they showcase a solid quiver of new boards available now worldwide! We're hyped to release a bunch of new product including the Lucy Cruiser and the Daze Longboard featuring prism reflective logos. Hit the link below to view all the new boards. On March 18th, Manhattan Beach opened a long awaited "skate spot", free to the community. At the event, there were free giveaways, a pro skater demo and a contest with cash prizes for the winners. After the skate spot opening, the crowd headed over to the Manhattan Beach Art Center where the California Locos kicked off an art show with live music and a book signing of there newly released hard cover, "Somos Locos". Dusters California featured there new skateboard collaboration with the Locos at the art show as well. This video sums up the fun and memorable times of the whole day from start to finish.